There’s a huge difference between a surface that’s been sanded and one that has not. The purpose of sanding surfaces, particularly wood, is to remove mill marks, dents, gauges, and other flaws that were caused by woodworking machines or in handling. The most efficient way to sand wood and other surfaces is to be deliberate and strategic. Sanding can be a drudgery so be sure to use only the right tools to get the task done. Proper sanding ensures you enjoy the benefits of a long-lasting finish and a consistent, smooth surface. Check out what types of sanding tools will help you achieve the best results. The sanding block is the one tool that is going to stand out the most on this list. It is the only manual option for sanding things and it is definitely the least expensive option that you can use. Using a typical sanding block is going to be very easy. You simply use your own power to rub the sanding block across whatever surface you are trying to sand. Of course, this can be a laborious process and it may not seem like the most convenient option. Sanding something manually is going to take an ample amount of time, in most cases. If you simply need to sand something such as a few cupboards, then it might seem like the simplest method. When you get into the large sanding projects, using a sanding block will begin to seem too arduous. Sanding blocks come in various shapes and sizes as well. Some of them will be shaped like a sponge and others will have a more trapezoidal appearance. You should simply purchase the size that you think will be the most convenient for you to work with. If you want to save some money when you have something to sand, then buying a sanding block is going to be far more cost effective than purchasing a power sander of any kind. You will be able to find sanding blocks at any hardware store and most major department stores will carry them as well. If you need to complete a project on a small budget, then you will be able to sand down surfaces with a sanding block effectively. It may fatigue you a lot more than a power sander would, but you’ll be saving a significant amount of money. It’s worth considering when you’re operating without a lot of funds to throw around. An orbital sander is going to be one of the simplest power sanding tools that you can make use of. It is possible to use an orbital sander with only one hand and it feels very natural to hold. The handling of these orbital sanders is really top notch, so you won’t ever feel like you’re having trouble with doing what you need to do. These sanders can help you to make quick work of small projects, so they’re very popular in the home improvement world. It should also be noted that orbital sanders are often referred to by other names. Some people call these sanders palm sanders or even circular sanders. Whatever name you wish to call this tool by is fine, but you should recognize that it is very useful. You can purchase one of these at a fairly reasonable price as well, so it’s a practical option when you need to sand things down for a small project. The orbital sander being shown here is very precise and powerful. When you consider the low price of this tool, it’s impressive just how well it performs. This is the next step up that you will want to take if you have been using sanding blocks for all of your sanding needs. A tool such as this will help to save you time and it will allow you to tackle larger projects more effectively. If you don’t have a lot of experience with using power sanders, then an orbital sander will be a good place to start. You’ll be able to feel comfortable using this sander and holding it will never present a problem. You can grip it in your palm and use it to effectively complete jobs right away. Belt sanders are among the most common types of sanders that you’ll see in people’s homes. It’s also very commonly used in professional workshops. The design of a belt sander is simple, featuring a sanding belt that is positioned over two drums. The drums move when you turn the motor on and it allows the sanding belt to do its job. There are different sizes of belts that you can use for a belt sander as well. Some will be better suited to certain tasks than others. Generally, the smaller belts are going to be the easiest to use and to control. The larger belts can be useful for covering larger surface areas, but they take a deft hand to be able to use them to their full potential. Using a belt sander will be perfect for removing the finish from any wooden items that you have around the house. It can work particularly well if there is an old finish on a wooden table that you need to take off before applying a new stain. You will find that owning a belt sander is really convenient and you’ll always want to have one around. If you do a lot of work with wood around your home, then you should really own a belt sander. An edging sander is a type of floor sander that will be used for preparing a floor to be stained or otherwise worked on. You will want to have a good floor sander when you’re working with wooden flooring. It’s going to make the job a lot simpler overall and it would take you forever trying to use another sander for this type of job. With an edging sander, you will be able to reach everywhere that you need to without it being a problem. You will be able to use your edging sander to get up against the corners of your flooring fairly easily. You can also use this type of sander on staircases, making it a very versatile tool. It is fairly easy to handle, so you won’t have too much trouble moving this where you need it to go. It stays fairly close to the ground and will allow you to refinish a floor much quicker than you would with another tool. You do need to take care when handling this tool, though. 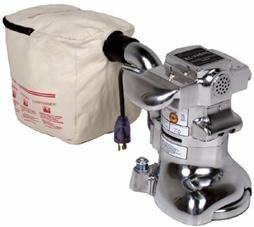 All floor sanders need to be used very carefully in order to avoid damaging the flooring. If you try to use it too quickly, then you can wind up causing huge problems for yourself. Remember to exercise caution and everything should be just fine, though. The drum sander is another type of floor sander that people commonly make use of. A drum sander is significantly larger than its edging sander cousin. This makes it more difficult to get it into certain positions, so it isn’t as practical for getting into the corners of the flooring. Some people prefer edging sanders because of this, but drum sanders do have their positive qualities. Drum sanders are incredibly powerful and can remove many things from the surface of your flooring. If you need to remove adhesives from your flooring, then this drum sander will be able to do the job very well. 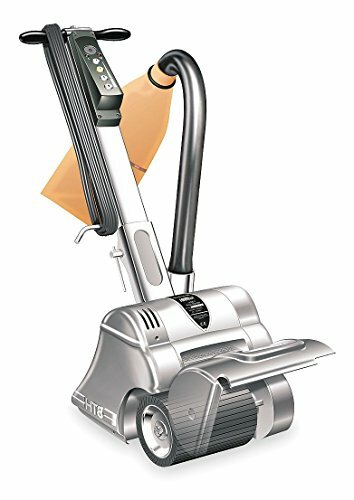 The overall power of this tool is the main selling point, and it can remove things that other floor sanders cannot. You’ll be able to make short work of paint and any other substances that you want to have removed from your flooring. This tool is very heavy, though. In fact, you’re probably going to need help handling this tool just to get it where you need it to go. It can be so cumbersome that two people will be required to transport it from place to place. It may not be the easiest sander to use in the world, but it will serve its purposes quite nicely. Also, understand that this drum sander can be easy to lose control of if you aren’t careful. You have to maintain your control over this powerful tool in order to avoid mishaps. Much like the edging sander, you could cause damage to the flooring if you are careless. 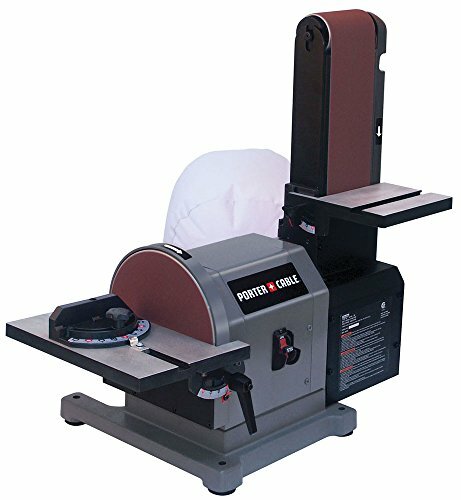 Be advised and try your best to respect the power of this drum sander while you’re using it. Sometimes this tool will also be referred to as a bench sander. No matter what name is being used for this tool, this sander is going to be useful when you need to sand things really quickly. It isn’t as well suited to precision work as some other sanders, but it is quite powerful. You can remove materials swiftly when you have one of these table sanders to work with. People who are into woodworking often keep table sanders handy. They’re really useful when you want to sand things as quick as possible. People even use these table sanders to help make musical instruments, so you can see how useful they really are. There are plenty of applications for a high-quality table sander. These table sanders are pretty big, so they’re used for industrial purposes quite often. Normal people buy table sanders often enough as well, but you’d typically want to own your own workshop area in order to store it properly. 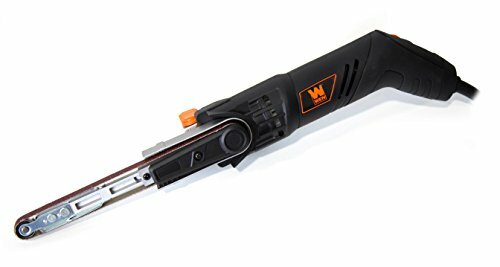 Tools such as this can be quite pricey as well, so it’s something that only someone who is serious about woodworking will want to consider purchasing. Consider how useful this would be for your purposes before making a purchasing decision. At first glance, you might assume that a random orbital sander is the same thing as an orbital sander. There are some subtle differences that you would be forgiven for not knowing about. A normal orbital sander has a square pad, while a random orbital sander has a circular one. The pattern that is used by the random orbital sander is different as well, and it doesn’t leave behind swirls as much as its orbital sander counterpart. For this reason, many people prefer the random orbital sander models to the normal orbital sanders. These sanders are very easy to handle overall, making them a perfect choice for someone who doesn’t have an abundance of experience with handling a sander. It can be used for multiple purposes and will pretty much always make the job easy. If you want a sander that will work well while remaining easy to use, then you should look no further. The cost-effective nature of this sander is impressive as well. People who are trying to sand things on a budget will appreciate the reasonable price of these sanders. You won’t have to pay an outrageous sum of money to get one of these and they will work well for your purposes. It’s a good choice for a general purpose power sander if you’re in need. This is a mounted sander that will work excellently to smooth out boards. Many people use these types of sanders to sand down the edges of pieces of lumber. It is very effective at this and you’ll enjoy having one around. It can make the process of preparing boards a lot faster than it would otherwise be. As you might expect from the name, this sander has an oscillating spindle protruding from the top of it. The spindle does a great job of accurately sanding down wood for you. It’s a really powerful tool, but it is actually really easy to make use of it. It’s even lightweight and portable, meaning that you can take it to a job site with you quite easily. You can change out the plates and drums to suit different sanding purposes. This gives it some extra versatility and makes it even more user friendly. Changing out the pieces is actually really simple, so it won’t take you long to get it set up exactly how you need it to be. This is another cost-effective sander too, so it’s worth purchasing for both professionals and casual DIY enthusiasts. This unit here is capable of providing up to 58 oscillations and 2,000 rotations every minute. You’ll be able to use this sander to great effect when you need to sand down boards. It’s great for people who work in the construction industry and will be good for home use as well. If you have a renovation project coming up, then owning an oscillating spindle sander will certainly prove to be useful. File sanders are usually used when people need to do accurate detail work. These sanders aren’t too big and they are kind of thin. This actually winds up working in their favor as it allows you to place the sander in spots where you couldn’t reach with another tool. This will help you to sand down areas that are in hard to reach spots and you can have an easier time than you otherwise would. These types of sanders will either be electric powered or air powered. The model that is being shown here is a corded electric model. It is pretty powerful for a tool its size and will be able to sand things very effectively. It is used to sand specific spots and isn’t as well suited to sanding large surface areas, so it’s something that you will buy to use in a particular way. This is a tool that you will want to purchase if you have spots that you cannot easily reach with your other tools. Some people use file sanders to sand down the tops of cupboards and others will use them to help reach an awkward angle. It’s simple to make use of this tool because it is lightweight and you can fit it where you need it to go. This particular model weighs in at only two and a half pounds, making it a really desirable tool. Drywall sanders are absolutely essential when you want a drywall project to turn out optimally. You can use these types of sanders in order to smooth out the surface of your drywall very nicely. It can remove any types of adhesive that are left after you have finished putting it up. A typical drywall sander is very long too, so you won’t have trouble reaching spots that are closer to the ceiling when you have a drywall sander at the ready. The length of a drywall sander is usually at least 10 feet, but this one here is 13 feet long. It is able to cover a pretty large surface area at once too. This allows you to get your drywall sanded down more swiftly, saving you an ample amount of time. This sander weighs eight and a half pounds, so it shouldn’t be too cumbersome to use for most people. This model comes with the extra handy feature of having a dust collection system installed. This makes things run even more efficiently and you won’t have nearly as much of a mess to clean up. Having a handy feature such as this makes it a good model to consider purchasing. It can be a little pricey to get a top-notch drywall sander, but if you work with drywall on a consistent basis, then it will pay to have a good tool such as this one. The detail sander actually has a lot in common with an orbital sander. It works in a very similar fashion, but there are some important differences that you will want to take note of. Firstly, the overall shape of this sander is quite a bit different. You may even think that it looks like an iron of some sort. The fact that it resembles an iron is partly due to it having a triangle shaped pad. This shape is well suited to detail work and you will be able to really put the finishing touches on certain projects using this sander. You can fit it into tight spaces without it being a big issue, allowing it to reach spots that your orbital sander could not. The compact nature of this tools lends itself well to portability as well, making this a really simple tool to take with you on jobs. 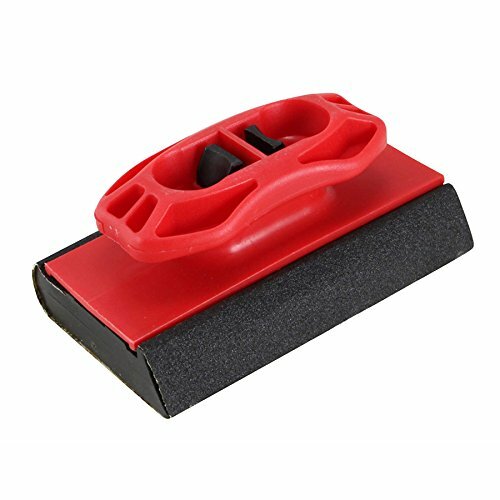 You will be able to purchase this sander with different types of sandpaper. The different types of sandpaper will be useful for different jobs. Changing out which sandpaper style you are using is rather simple, so this is a very user-friendly tool. It won’t be difficult to make use of this tool and you’ll have an easy time getting the detail work finished. This particular detail sander can be gripped in three different positions as well. You can use the traditional palm grip if that is the most comfortable style for you. You can also grip it using the handle grip for tight spaces and the precision grip for when you need increased maneuverability. You’ll want to consider purchasing this tool if you need something to do finer sanding work. Disc sanders are something that many people like to use because they’re very simple to operate. They’re good for several different purposes and you will be able to tackle several jobs if you own one. You may have heard of disc sanders that are attachments for drills, but this is a standalone unit. There are also disc sanders on the market that attach to table sanders, but this one is meant to be used by hand. You can take this disc sander wherever you need it to be. It is extremely lightweight and portable. Many professionals choose to take sanders such as this with them on a regular basis. It is also quite useful for completing different DIY projects around your house. It won’t feel cumbersome to use this sander for a long time. It weighs just under five pounds and feels very natural to hold. 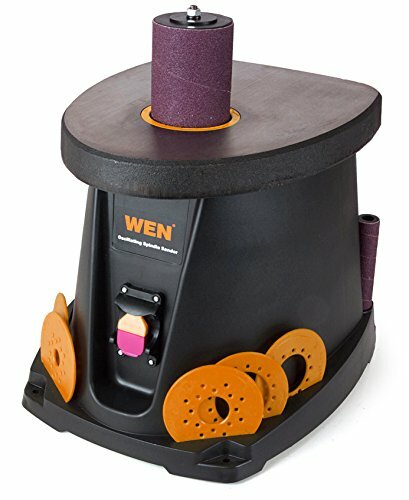 The grips on this sander allow you to maintain good balance while you’re working. It never feels like the sander is going to slip and this makes completing a job as simple as possible. This may not be as powerful as certain orbital sanders, though. For the most part, this really serves the same purpose as most orbital sanders. You will just want to determine which of these sanders appeals the most to you and will work the best for your purposes. The price of this sander is very reasonable, so it is a good purchase when you’re in need of a lightweight sander that is simple to use.